Booking.com is honouring 200,776 properties in 176 countries with its 2014 Award of Excellence, an important symbol of the company’s commitment to work together with its global network of accommodation partners to facilitate incredible experiences for customers from every walk of life. The average score amongst properties receiving the award this year is a record 8.7 out of 10. A total of 4,617 Australian properties received an Award of Excellence from the world’s leading online accommodation provider, with 10 the highest score awarded and an average score of 8.64 across all properties. The Award of Excellence is given out by Booking.com to properties on an annual basis, in honour of their achievements over the past year as measured by their overall guest review score. 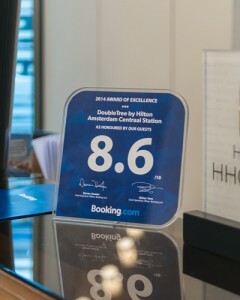 To receive an award, partners of Booking.com must have an average review score of 8 or higher, based on at least 10 guest reviews as of 11:59pm on 31 December 2014 CET. “Connecting travellers of all backgrounds with the world’s best places to stay is at the core of our mission at Booking.com,” says Gillian Tans, President and Chief Operating Officer at Booking.com. “We take this mission very seriously and are exceptionally proud of our global network of partners who consistently deliver on providing the best possible experience for our customers. Our Award of Excellence is presented to a select group of partners, in recognition of our shared commitment and passion for getting it right for each and every guest.” Leading the pack in terms of the sheer number of awards this year is Italy, with 27,766 properties being honoured. Other countries at the top of the list include the United States (18,392), France (14,096), Germany (12,171), Spain (11,819), and the United Kingdom (11,227). The countries with the highest average score this year are Austria and Belgium, with an average guest review score of 8.84 amongst the properties being recognised for their efforts in 2014. An impressive 66 properties are being awarded for having a perfect score of 10 this year, including 15 in the United Kingdom, 7 in Italy, and 5 in Canada. Nearly half of all properties being honoured in 2014 (97,419) have an average review score of 9 or higher.Booking.com currently features more than 42 million guest reviews on its website and mobile apps, and in 2014, the company received an average of 104,669 guest reviews per day. The five most prolific countries in terms of guest reviews submitted in 2014 were the United Kingdom (3,925,802), Germany (3,569,200), France (3,478,905), Italy (3,119,369) and the United States (2,705,377). Brazilian, British, Russian, American, and Australian guests commented more frequently about food and beverages compared to other review topics in 2014, while German, Dutch, and Spanish customers talked mostly about the staff and location. In contrast, one of the most frequently mentioned review topics by French guests was the in-room facilities, while Italian customers focused more on transportation and parking. All of Booking.com’s guest reviews are from within the last 14 months and are written by real guests after they have stayed and checked out of the accommodation. There are a number of safeguards in place to guarantee that each review is current and authentic. Booking.com’s guest reviews are never edited in any way. However, reviews containing profanity, and/or political, religious, and racist remarks (amongst other content that is flagged for additional review) are not displayed.